Also called Christmas melon or piel de sapo. The name piel de sapo literally means “toad skin”. Piel de Sapo is a winter melon variety along with honeydew, Crenshaw, Casaba and Canary. It is an oval shaped melon originating from Spain. It has a thick rind (peel) with varying shades of green and yellow depending on the cultivar. The background colours are usually lighter with dark green bands above and a yellow patch. 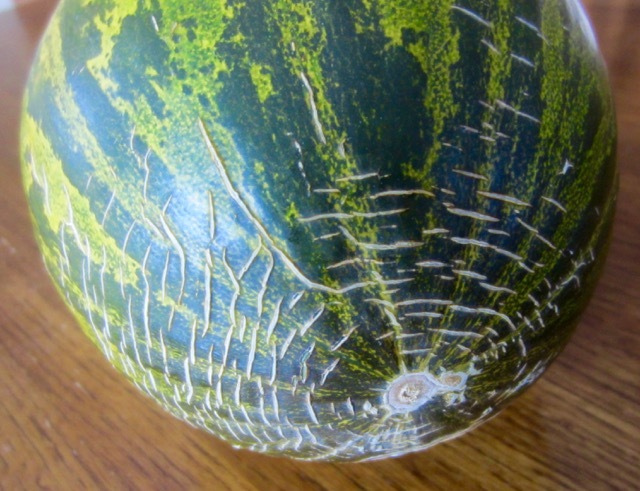 The skin (rind) is slightly ribbed (honeydew has a smooth skin). The rind may also be reticulate (netted) on either end. 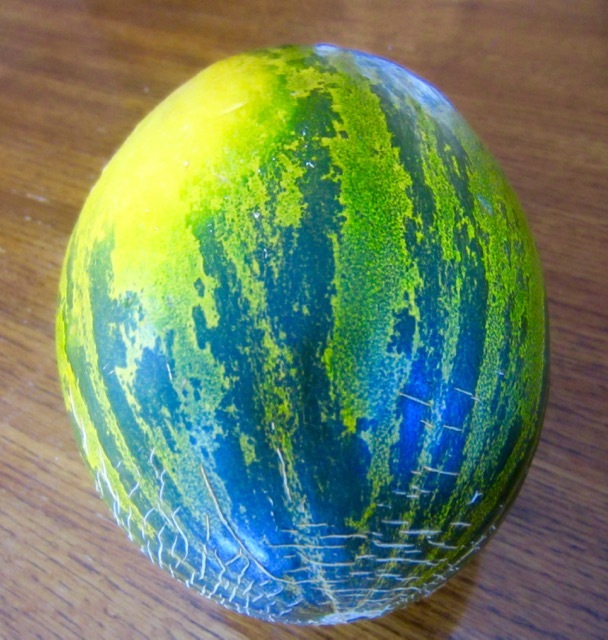 Due to the thick rind (skin) the fragrance is subtle and the melon does not release a strong aroma when ripe. Size: The Santa Claus melon can grow up to about 12inches (30cm) in length. 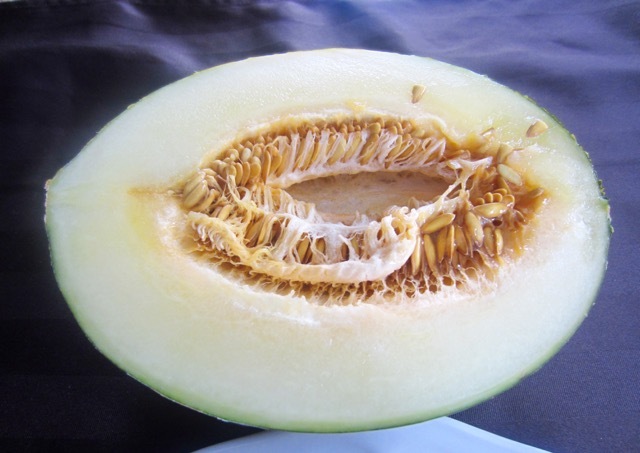 The flesh is pale green to white, mellow and juicy, with a mild melon flavour and sweetness close to honeydew melons. Winter melons belonging to the variety inodorus require a longer time on the vine to fully ripen (110 days). They ripen slowly so they can be picked when mature but not fully ripe and they will ripen slowly in storage. They are known for their thick rinds, a characteristic which allows them have a long shelf life and to keep until the Christmas month in winter. Cholesterol free, fat free, low sodium, excellent source of Vitamin C. and potassium. Due it its sweet flesh, the Christmas melon can be used in fruit salads, tarts, sorbets and sauces. It makes excellent puree so can be used in gazpacho, smoothies and cocktails. Its flavour pairs well with creamy cheeses, cured meats, mint, basil, citrus fruit and extra virgin olive oil. How can you tell the melon is ripe? 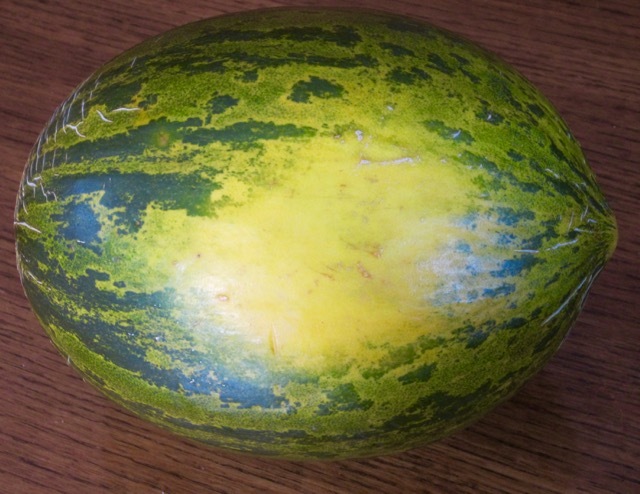 Santa claus melon can be bought when not fully ripe and allowed to ripen. It can take a few to several weeks to ripen. Be patient. This one of mine took about 6-8 weeks to ripen. When fully ripe, the Santa Claus melon will have a vibrant yellow hue and a soft blossom end (apex) that yields to gentle pressure. The soft blossom end is the best test for ripeness. Because of its thick rind, this melon does not release a tell-tale aroma when ripe. 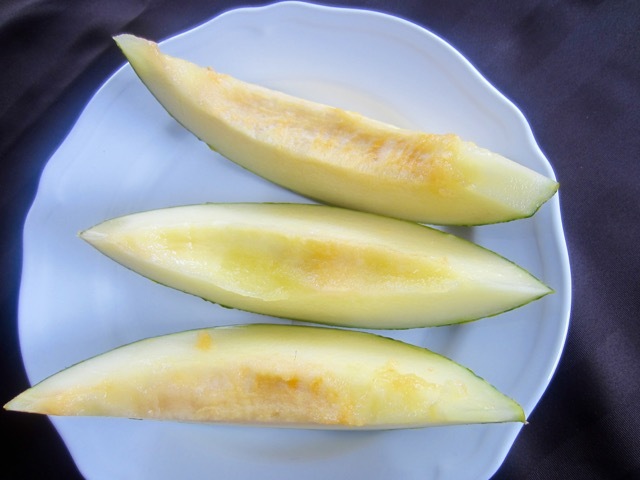 *Unlike Santa Claus Melon, true European cantaloupes and netted melons (north American cantaloupes) do not ripen much after picking, so you should not buy them if they are definitely hard. Christmas melons have a long shelf life due to their thick rind and the fact that you can buy them before they are fully ripe. Once ripened or cut, it should be refrigerated in plastic. Season is late spring and summer. During the winter months, Santa Claus melons are shipped from South America, Spain and Brazil. Grown in California and Arizona, where they are harvested from June through October. Also grown in South America, Spain or Brazil. Cucumis melo var. cantaloupensis (true cantaloupes from Europe) are not commonly grown in the U.S.A. They have deeply grooved fruit with a hard, warty or scaly rind and orange or green flesh. Cucumis melo var. reticulatus are the netted, aromatic melons also known as North American cantaloupes; and Persian melons. Cucumis melo var. 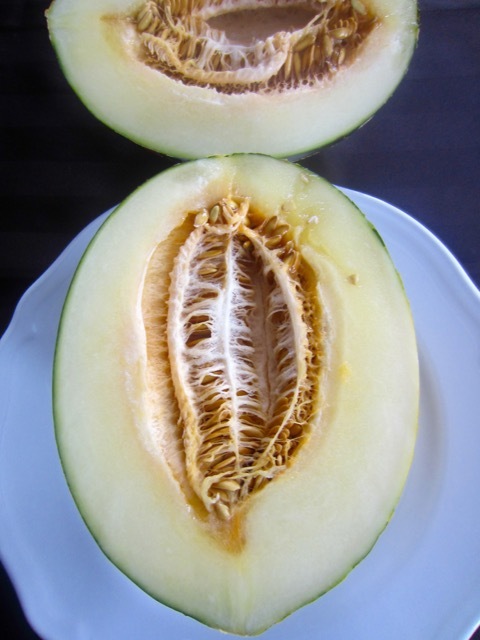 inodorous include casabas, crenshaws, honeydews, and the late-maturing winter melons. Cucumis melo var. flexuosus, the snake melon. Cucumis melo var. conomon, the Oriental pickling melon. Melons: Cantaloupe, Muskmelon, Honeydew, Crenshaw, Casaba, etc. You can take this “melón” with “Jamón Ibérico” (Iberian Ham).It is delicious!! Oh that is so good. I’ll try it!!! !